Just a few miles east of the Big Bear lake is a unique little known geological feature, a natural hot spring. For centuries this place was a favorite spa for the local Serrano Indians. In 1921, Emile C. Jesserun arrived in Big Bear and purchased the hot spring along with 40 additional acres from the owner of the Shay Ranch. In 1924, he built a large resort on the site of the hot spring, and called it the Pan Hot Springs Hotel. Jesserun’s hotel was located just east of today’s Paradise and North Shore Drive intersection. It sat alone in what had, up until then, been grazing land. This was years before Big Bear City, any of the roads or homes that are now in that area ever existed. The Pan Hot Springs ball room had a medieval decor with suits of armor, hanging tapestries, swords and lances decorating the walls. Jesserun also built two swimming pools, indoor and outdoor, that were filled with the naturally flowing hot mineral water. The Pan Hot Springs Hotel was an immediate success. Unfortunately it burned to the ground in 1933, just nine years after it was built. It was never rebuilt, but the swimming pools were reopened to the public, and they served the Big Bear community up until the early 1990’s, when they eventually had to be destroyed because of earthquake damage. 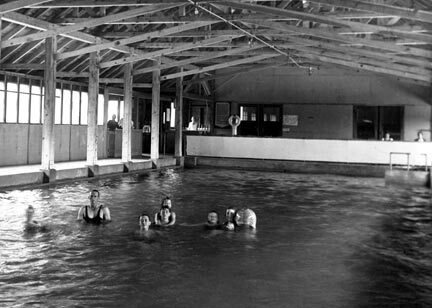 The Pan Hot Springs hotel had both indoor and outdoor swimming pools flowing with warm mineral water from natural underground hot springs. – Rick Keppler collection. However back in 1925, when the Pan Hot Springs hotel was in full operation, it caught the attention of a guy by the name of Harry Kiener; a land developer looking for mountain property upon which he could build a major new resort and a subdivision. Kiener decided that being located near the Pan Hot Springs Hotel would be ideal. He set up a corporation, and began laying out plans for his new project called the Peter Pan Woodland Club. Kiener knew that all of the other lodges at the west end of the valley that had the advantage of being on or near the lake. If his new lodge was going to be able to effectively compete, he was going to have to build the most exclusive resort in Big Bear, and he set out to do just that. He began modestly by building a relatively small lodge building on a hill near Greenway in today’s Big Bear City. The serious work began in 1927, when Kiener submitted plans for a subdivision, and hired Guy Maltby to build a new larger clubhouse. The new clubhouse that Maltby built for the Woodland Club was a massive four story structure that sat facing north near the intersection of today’s Greenway and Country Club Drive. One of the most impressive features of this clubhouse was a huge rock fireplace that had a fire pit that was large enough to hold the front end of a car. A small electric railroad was built into fireplace with model trains winding their way among the rock work. In addition to a new clubhouse, the Woodland Club had it’s own golf course, swimming pool and tennis Courts. There was even a movie theater, and guests had exclusive access to the clubs hunting preserves, bridal paths, and gymnasium. Kiener also built a water company and a water system for the new subdivision which had been laid out around the golf course, where the east end of the airport runway is located today. Lodging at the Woodland Club was expensive and restricted to members and their guests. It was a true destination resort with a celebrity guest list that read like a “who’s/who” of Hollywood. The Peter Pan Woodland Club reigned as Big Bear’s premier resort up until June 18, 1948, when the main club house was reduced to ashes by an early morning fire. The club house was replaced with a smaller building. It then reopened as the Peter Pan Rancho. But the Rancho was never able to capture the grandeur and magic of the original lodge. Today, the only physical remains of the old Peter Pan Woodland Club are the stone pillars located along Greenway and Country Club Drive, but the permanent legacy that the Peter Pan Woodland Club left for us is the community of Big Bear City. Additional photos of the Woodland Club will be posted in the “Lodges in Big Bear City” Photo Album this coming week.